My introduction to the writings of father Jacques Philippe was Time For God, which I first read 11 years ago. I have reread that book for times now and every time I read it I get something more out of it. And when he has a new book come out in French I eagerly await it being available in English. Thankfully for this book the wait was less than a year. 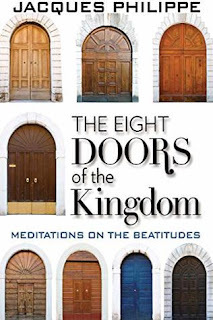 This book combines two of my favorite things, the incredible spiritual writings of Father Philippe and the beatitudes. If I may digress for a sentence or two, it was in part the beatitudes that helped me return to the church. Specifically, Matthew 5:6 'Blessed are they who hunger and thirst for righteousness for they shall be filled.' At a low point late in my teen years I had wandered away from the church. I was searching and in a used book store a bible that that verse and one other marked in the front cover. After finding and reading the passage I knew it described me and where I was at. And so to have a book by father Philippe on these 8 beatitudes is I am certain a blessing for all who will read it. And Several others. At the end of the book there is a brief sections on the works cited. It provides details not only on the work cited but which translation was used in preparing this book. What Is My Deepest Desire? "The fourth Beatitude points to a question: What is my deepest desire? Hunger and thirst are images of desire for in what is most vital and essential. It is good to put this question to one's heart: What is my deepest desire? What do I really hunger and thirst for? What desire is the principle of unity for my life? It is natural that one have several desires, yet this can be a source of interior division and the accomplishment of some of our desires can lead us to an impasse or deceive us. St. Paul speaks of the need for a certain filtering or discernment, to distinguish those that come from the "flesh" (our wounded psyches) from those that come from the "spirit" (our authentic aspirations for what is really good for us and the promptings of the Holy Spirit). But among all our desires one is dominant in that it gathers together and unifies all the others. We find in one of the Psalms this wonderful prayer: "Teach me thy way, O LORD, that I may walk in thy truth; unite my heart to fear thy name." And Jesus says: "He who does not gather with me scatters." In failing to direct their desire toward God, people risk 'scattering' themselves." "In the end, then, to be hungry and thirsty for justice means ardently desiring that God be better known and loved. It means desiring to respond to ingratitude by a surfeit of love. It means wanting to embrace God, love God, and trust God to make up for all those who do not embrace, love, and trust him." As can bee seen from these few brief examples on one of the beatitudes this book has a depth of meaning and can have an even deeper impact upon our lives. After reading a book like this one, I want to shout from the rooftops about it. I mention it frequently in conversations, I give copies of it away to friends and clergy. This is a book that will have a lasting impact upon its readers. I have loved all the books I have read by father Philippe, each of them has garnered 5/5 stars, but this might be the best of the lot. If you are a fan of his writings run out and pick up this book. If you are unfamiliar with his works, this book will be an incredible introduction into his writing style and thought. An incredible read!